Learn what to look for in an authentic Rolex watches before you buy one and only buy from a reputable authorized dealer. Authentic Rolex watches will never lose their value, and perhaps they will increase over time. An authentic Rolex watch tells others that you are successful, stylish and appreciate fine, well-made items. Click HERE to visit our Rolex page for more information. In 1908, a German, Hans Wilsdorf, and his brother-in-law, Alfred Davis, set up a company called Wilsdorf & Davis in London. The company’s agenda was to create smaller watch movements. Pocket watches were prevalent at the time, and achieving accuracy was difficult on anything smaller. By 1910, Hans Wilsdorf sent his first movement in a wristwatch to the School of Horology in Switzerland. 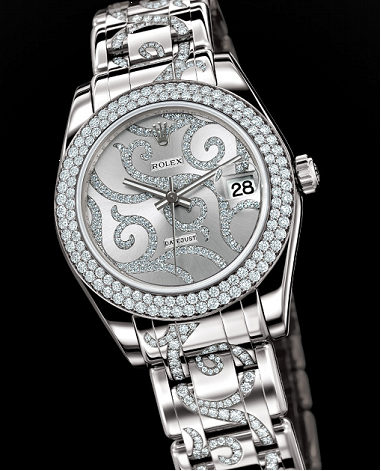 The watch received the Chronometer Award for best “accuracy” of timekeeping. It was the first time that this award was bestowed upon a wristwatch. With award in hand, Wilsdorf perfected the watch further with dust and waterproof watch cases and skillfully advertised his watches around the world. Wilsdorf registered the Rolex name in Switzerland in 1915, and its timeless appeal made history. #1. In most watches catalogues and in-store displays you’ll find the time is displayed as ten minutes past ten o’clock or sometimes ten minutes to two o’clock. The popular meaning for this is that it’s “Happy Time” or that the clock is smiling which becomes an emotional marketing tool to encouraging you to feel good when you’re looking to buy that particular watch or clock. #2. Many years ago, devices for telling the time were created by the Egyptians around 1500BC. Known as sundials time was measured by a shadow falling in sections across a marked area. Water clocks were used later with more accuracy. #3. Rolex created the first wrist watches with the date on the dial, and the first watch to display two different time zones at the same exact time. #4. In 1904 Louis Cartier, French watchmaker, was asked to design a watch for his aviator friend Alberton Santos-Dumont. Cartier created the watch and named it “Santos”. #5. During World War One it was common for men to wear watches on their wrists rather than on a chain around their neck. This simple change made it easier for men to tell the time without moving their hand. Previously men wore pocket watches on chains and women wore wrist watches. #6. In the movies Daniel Craig as James Bond wears an Omega watch, Sean Connery as James Bond wears a Rolex Submariner. In the Bourne Ultimatum, Matt Damon wears a TAG Heuer watch. Breitling watches are very popular with celebrities, actors and world famous successful entrepreneurs including Sir Richard Branson and Sir Alan Sugar. #7. Of all the colours available for watches most people will own or be given a black watch during their lifetime. The unisex colour is a favourite with mens watches and ladies watches alike. #8. Continuing the fashion of watches, Breguet watches began in 1775 with Abraham Louis Breguet setting up his watch-making shop in Paris. There are about a dozen different designs of authentic Rolex watches. The top all-time sellers are within the Oyster series. The Rolex Cellini imparts an executive aura. Also included in their fashionable collection for men are Daytona, Explorer & President, Explorer II, GMT-Master-II, Sea-Dweller, Submariner and Yacht-Master. Women are never left out of the Rolex assortment either, with much of the styling similar but smaller than the masculine counterpart. Distinguish the authentic Rolex watch from the not real by the model numbers. The model number is a code and ranges from four to six numbers. It is located at 12 o’clock between the lugs and under the bracelet. Each digit will signify the type of model, bezel and materials used to manufacture the watch. Sitting opposite the model number is the serial number at the 6 o’clock position, between the lugs and under the bracelet. The Rolex system consists of one letter followed by six digits. The letter differentiates the actual time period that the case was made, but not the watch. The balance of the numbering system can only be deciphered by Rolex and only the company knows the meaning on each watch and when it was made.